Gray and white landscapes float by, dotted by leafless trees and country log homes with swirls of smoke piercing the cold clear air. The sound of the train wheels rolling along in the late night darkness has a hypnotic rhythm. It is like rolling back in time, in a slow and purposeful way. 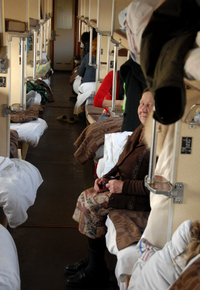 Provodniks or train attendants run a tight ship and keep the compartment in order. They are also the gatekeepers of the bedding, candy and coffee. Sometimes in the middle of the night I would sit up in my bed and peer out the window, watching the black landscape, illuminated slightly by moonlight go racing by. Occasionally a dimly lit farmhouse nestled in the woods would suddenly appear. Questions filled my mind, who lives there, what do they do, what do they dream about, what is their life like? Questions that I know will never be answered, but seem to be ever present in the curious mind of a traveler. I always seem to find myself on the edge, just a little. I resist a small current of fear that I might make a mistake and find myself in trouble with the police for some unknown reason. Years of propaganda seem to have taken a toll on me. But, most importantly, at the end of each day I have a huge smile of gratitude for where I find myself! The Russian countryside outside my train window. Dear Dean, I am glad that you came to my school today, today is Arp.16,2008 it made me fell good when you askde me what I leard today and I said no matter what we all come together as a huge family. I thought I was going to cry because felt good to learn more about my self and other people around me and the world. That brightend up my day so for that I say THANK YOU!!!!!!!!!!!!!!! Yes, the bunk was a little small for me. But is was warm and dry, the most important things in the Russian winter! I am looking forward to my visit to your school! The picture of the train was amasing. Were you scrunced in the bunk? That was a great picture of the countryside out of your window. I hope you have fun on your travels. I look forward to that "cheers"! Have a good Christmas buddy! Great to hear from you, have a really good Christmas! How are things at Silva? I hope you and Gail are holding down Fremont while I am away! ps I'll see all of you when I get back! Great to hear from you, thanks for the post! Yes, I did get to Lake Baikal, and even did a little dog sledding while I was there...more to come on that. I look forward to seeing you when I get home. That photo in front of the train brings back SO many memories... I cannot wait to talk with you about Russia and compare experiences. I hope you were able to see Lake Baikal, which is perhaps one of the prettiest places in the world. And you are spot on with describing how you share two to three days with a person that speaks not a word of English, yet is your best friend. Unfortunately for me, I once spent two solid days with two Russian soldiers that not only didn't speak English, they also tried their dardest to get me and my traveling companion to drink Beer EVERY HOUR on the hour from 5:30am to 11:30pm. Gotta love the Trans-Siberian Railway, eh? We will be thinking of you this Christmas season. Best of wishes to you on your travels and we will "cheers" to you on our next gathering. P.S. Take it easy on the vodka. Great pictures! I hope you have a safe and happy holiday season, you will be in our thoughts. Have fun and be safe! I will be somewhere in Mongolia for Christmas! You are in the throes of wonder and enchantment. I hope you have a warm and blessed Christmas, wherever you find yourself. I am always anxious to stay in touch by your postings!